The GeForce RTX 2070 delivers an incremental upgrade over the previous generation 1080, and alters the definition of midrange price as well as performance. Historically, Nvidia's second-string x70 cards have delivered the best price to performance ratio, making them easy picks for the best graphics cards. Sure, the x80 model was faster, but it also cost significantly more. The GTX 970 and GTX 1070 were the most popular cards of their day, and the RTX 2070 was expected to continue that tradition. 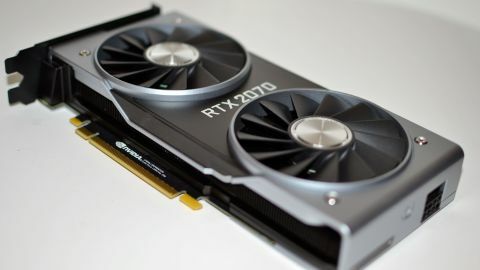 Unfortunately, lack of competition from AMD could make the RTX 2070 the least desirable step-down graphics card in Nvidia's history, and with a base price of $499—$599 for the RTX 2070 Founders Edition we're looking at in this review—the newest member of the Turing family definitely isn't going after the $300-$400 price point we like for mainstream GPUs. That's the bad news. The good news is that Nvidia says the 'reference' RTX 2070 cards should be widely available, meaning the $100 price premium on the Founders Edition shouldn't be required. The RTX 2070 is also plenty fast, beating the previous generation GTX 1080 in virtually all the games I've tested. But we were spoiled by the large generational upgrade of the GTX 1070, and in contrast the 2070 feels more than a little underwhelming. The GTX 970 remains one of the most popular graphics cards ever produced, even with its 3.5GB + 512MB segmented VRAM snafu. The GTX 1070 brought significantly improved performance, topping the previous generation GTX 980 Ti at a substantially lower price. The RTX 2070 meanwhile clearly falls short of the GTX 1080 Ti, and only delivers a modest 10 percent improvement over the GTX 1080. Is that enough to tempt gamers to upgrade, or will they be sitting out this generation? There's hope in the way of ray tracing and DLSS enabled games. We're still waiting for the games to arrive on both counts—all we have right now are a few tech demos of the technologies—but RTX 2070 includes all the new features that have the potential to make the Turing architecture the biggest revolution in graphics processors in more than a decade. The question is whether the chip will pack enough of a punch to make ray tracing viable. With a bit more than half as many processing cores as the TU102 used in the RTX 2080 Ti and similar clockspeeds, it's basically half the performance potential as well. I've discussed those areas previously, and with the RTX 2080 and 2080 Ti reviews in the books, it's time for the third leg of Nvidia's Turing journey. I'm starting with the RTX 2070 Founders Edition, which sees similar design updates as the other two models. It's a shorter design so it can fit in more compact cases, but it keeps the dual axial fans and thick metal backplate. It also comes with a 90MHz GPU core overclock relative to the reference 2070, along with the VirtualLink connector for future VR headsets. Incidentally, the 2080 Ti and 2080 are heavy compared to previous models: 1327g and 1257g to be precise, compared to 1013-1037g for the GTX 1070 through 1080 Ti (which used the same basic design). The shorter length of the 2070 makes it a slightly lighter card, 970g to be precise, but EVGA's RTX 2070 weighs 200g less. I'm still investigating the cooling and overclocking potential, and heavier doesn't inherently mean better cooling, but the RTX Founders Editions certainly bulked up compared to previous models. The focus this round will be on real-world gaming performance. Looking at the raw specs, the RTX 2070 appears to be similar in performance potential to the GTX 1080. It has fewer CUDA cores, but it also has a new architecture and GDDR6 memory that should keep it in the lead. In the future, games that make use of ray tracing and DLSS (or other elements of the Turing architecture) should see even bigger gains, but all the games currently in my test suite use a traditional rendering pipeline. I've had some time to invest into overclocking the 2070 on this occasion. Running the Founders Edition at stock clocks, most games would see the GPU clock close to 1800MHz—higher than the advertised GPU Boost speed, which is typical of Nvidia's gaming cards. After poking around with MSI Afterburner and EVGA's Precision X1, I settled on a 750MHz GDDR6 overclock (15.5 GT/s effective), a healthy 10 percent boost—I was able to ramp up to 16 GT/s but started experiencing artifacts and backed off a bit. For the GPU core, I increased voltage by 100mV, adjusted the fan speeds to favor cooling over noise, set the power level to 114 percent, and set the GPU core to +125MHz. This resulted in a relatively steady 2000-2040MHz, and more importantly I was able to complete all my gaming benchmarks without crashing. The overclocked results for the 2070 FE are included in the charts. I've retested all graphics cards for the Turing launch, and while a few driver updates have come out in the past month, performance in my test suite appears to be stable. My graphics card testbed uses a Core i7-8700K overclocked to 5.0GHz, which should help to minimize CPU bottlenecks during testing. Previous Nvidia and AMD GPUs were tested with Nvidia's 399.07 and AMD's 18.8.2 drivers, the GeForce RTX 2080 and RTX 2080 Ti were tested with 411.51 drivers, and the RTX 2070 was tested with the 416.33 drivers provided by Nvidia. The RTX 2070 isn't really targeting 4k, but I'll start at the top. Performance in current generation games is clearly a step down from the GTX 1080 Ti—16 percent slower at 4k ultra—and relative to the GTX 1080 the RTX 2070 FE is 12 percent faster on average. Forza Horizon 4 is the only game where the 1080 leads the 2070, perhaps thanks to better optimizations for the existing Pascal architecture. It's important to reiterate that the RTX Founders Edition cards are factory overclocked, however, and the reference EVGA RTX 2070 is only about 8 percent faster than the GTX 1080. 1440p ultra is the sweet spot for the RTX 2070, with nearly every game tested breaking 60fps (Deus Ex: Mankind Divided is the sole exception). Many games run at 100fps or more, making for a nice upgrade if you have a 144Hz G-Sync display. Most of the graphics cards are completely GPU limited here, so the net advantage of the 2070 over the 1080 remains at 12 percent. And there's still future potential with DLSS in particular—see below for additional testing details. The RTX 2070 isn't really built for 1080p gaming, particularly if you're running lower quality settings. Just about any decent GPU will suffice here. But just to be complete, you can see the results in the above gallery. At 1080p ultra, the 2070 still shows an advantage over the GTX 1080, to the tune of 11 percent, so we're not fully hitting CPU limits. 1080p medium on the other hand drops the performance advantage to just 5 percent. 1080p might also be a reasonable target for future games that leverage ray tracing. I'm skeptical that even a 2080 Ti will handle 4k with ray tracing at 60fps or more, and the 2070 certainly won't hit such a lofty target. But 1080p, perhaps with 'medium quality ray tracing' is a different matter. Too bad we don't have any ray tracing games just yet. I've mentioned that we don't have any games with ray tracing or DLSS yet, which is true, but we do have a few demos that Nvidia has provided. On the ray tracing front, Nvidia's Star Wars Elevator demo uses DXR (DirectX Ray Tracing) and theoretically runs on any DX12 capable GPU. I couldn't get it to work on a 1080 Ti at 4k, but at 1440p it managed to successfully complete the test sequence—and at a stunningly uncinematic 10.1 fps. Yeah. (And anyone that suggests you can't see more than 10fps in a movie needs their vision checked.) What about the RTX 2070? Even at 4k, it manages double the framerate of the 1080 Ti: 19.7 fps. Drop to 1440p and it runs at 34.5 fps. Score one major victory for the RTX 2070 over the 1080 and 1080 Ti, provided you're using the ray tracing hardware. The other two tests skip ray tracing and instead go after the more easily enabled DLSS. Running at half the resolution (2716x1527 instead of 3840x2160) and then using a deep learning trained network to upscale and remove jaggies, DLSS aims to provide equivalent or superior image quality to 4k TAA, but with substantially better performance. It's difficult to say whether the quality is truly equal or not, but to my eyes I'm sure I couldn't spot the difference without capturing screenshots and then carefully analyzing frames. Which is another way of saying that Nvidia appears to have achieved its goal. And unlike ray tracing, you pretty much can't do DLSS without Turing's Tensor cores—not at acceptable performance levels anyway. There are two demos with DLSS right now, and the first is a special release of the Final Fantasy 15 benchmark tool with DLSS support. (It should be available to the public by the end of the month.) It's currently limited to testing at 4k, with TAA or DLSS. As a baseline, a GTX 1080 Ti scores 3273 (32.1 fps) with TAA, the RTX 2070 scores 2735 (26.7 fps), and an RTX 2080 Ti gets 4358 (43.1 fps). The 2070 loses to the 1080 Ti, but DLSS flips the tables and the 2070 gets 3766 (37.2 fps)—and the 2080 Ti gets 5963 (59.0 fps). If you're wondering, those framerates are captured using PresentMon—which I also used for the Star Wars Elevator demo and the final benchmark. The Infiltrator demo is similar to FF15, only it uses Epic's Unreal Engine 4 with DLSS support added. Again, it's currently limited to 4k, with either TAA or DLSS. Running with TAA, the GTX 1080 Ti scores 45.3 fps, RTX 2070 gets 36.5 fps, and RTX 2080 Ti hits 60.1 fps. Flip over to DLSS and the RTX 2070 gets 52.7 fps while the RTX 2080 Ti improves to 83.1 fps. Mission accomplished, at least in demo form. These early DLSS and ray tracing results show the potential of Turing graphics cards, including the RTX 2070. For games that leverage the new features, the 2070 will surpass even the GTX 1080 Ti, often by a sizeable margin. But until games start showing up, we're stuck waiting. This is also a topic that will really muddy the comparisons in the future, since you basically can't do ray tracing or DLSS at reasonable framerates without the Turing hardware. Instead of being clearly faster, it will be a question of choosing between image quality and framerate. I've talked about performance, and the RTX 2070 delivers a modest improvement over a GTX 1080. The problem is that the 2070 Founders Edition costs quite a bit more than a GTX 1080 these days. Of course, the GTX 1070 through 1080 Ti are on their way out—Nvidia isn't going to be manufacturing more of those chips now that their replacements are out. Nvidia also says it's working to ensure RTX 2070 cards at the lower $499 entry point will be available at launch, but I'm skeptical. I've got EVGA's reference clocked RTX 2070, but with most 2080 Ti cards being sold out, and other graphics card vendors saying supplies of the 2070 are tight, this is something we'll have to keep an eye on going forward. But let's assume the EVGA card will sell for $499 and the 2070 Founders Edition will cost $599. The above gallery shows fps per monetary unit, for both the graphics card in isolation as well as for a complete system build (using a $1,000 PC, not counting the cost of the display, OS, or graphics card). As it stands, if you're building a new high-end gaming PC, the RTX cards make sense. If you already have a gaming PC and you're thinking about upgrading the graphics card, it becomes a far more complex decision. An RTX 2070 for $500 is going to offer a similar value to a GTX 1080 for $450—in existing games, at least; it would be better in future DLSS enabled games, obviously. But the midrange cards like the RX 570/580 and GTX 1060 remain the best value overall. I'm not sure when we'll see RTX 2060—or even if we'll see those—so it's a case of wait and see. Prices should come down in the coming months as supply of the new GPUs increases, and maybe AMD will offer a bit more competition as well. But it's easy to see why some are giving the RTX 2000 cards a pass. Buying the fastest graphics card has never been a good idea if you were after a good value. Instead, it was the second tier GPUs like the GTX 770, 970, and 1070 that typically won our pick for the best overall graphics cards. Unfortunately, the RTX 2070 doesn't continue that tradition. Everything is in place for it to be the next great midrange GPU, except for the price which is decidedly high-end. We've seen prices fluctuate in the past, from $400 for the 670 and 770, to $329 for the 970, and then up to $449 ($379) for the 1070. With its Turing RTX 2000 series, Nvidia has bumped each product into the next higher category. As such, RTX 2080 Ti has a Titan price, the RTX 2080 takes over the former 1080 Ti slot, and the RTX 2070 gets the 1080's place. The RTX 2070 isn't a bad card by any means—it's faster than a 1080, and has some compelling new features that can make it faster than even a 1080 Ti. The problem is we don't have games using those features yet, and after two and a half years an incremental upgrade in performance for a higher price is at best underwhelming. But with 25 games (and counting) set to support DLSS, and at least a dozen games planning on ray tracing support, if you're buying a high-end GPU today, we recommend getting at least the RTX 2070—preferably a non-Founders Edition, for $100 less. What we really need right now is for AMD to provide some competition to Nvidia. RX Vega isn't going to cut it, especially if we start talking about efficiency. A second Polaris refresh won't do much either, I suspect. Unfortunately, 7nm Vega is a hazy question mark for consumer cards, and Navi is likely at least a year away. And that's why Nvidia can justify charging higher prices than previously. It's also why Nvidia can take a risk and push features like DLSS and ray tracing. The GeForce RTX 2070 Founders Edition is a very capable card. It has decent overclocking potential, it runs quiet, and temperatures under load are acceptable. If we were looking at pricing similar to the outgoing GTX 1070, it would be an excellent upgrade—40 percent faster for the same price! Unfortunately, it's 40 percent faster than the 1070 with a price that's 40 to 70 percent higher. I'm scoring the RTX 2070 Founders Edition as it performs today, on the games we're currently playing, and factoring in the Founders Edition pricing. Long-term, DLSS and ray tracing could make it a far more interesting card, but unless you're already planning a new PC build, I'd hold off on the RTX 2070. Even if you do want an RTX 2070, a different model is almost certainly a better value.